CLEVELAND — Cleveland police are working to connect with youth through open discussion. The department’s Black Shield, a group of African-American officers, attempted to build relationships with northeast Ohio teens during a dinner meeting. Six teens and six cops came with one goal: help the teens feel comfortable in their skin, in predominantly white spaces. 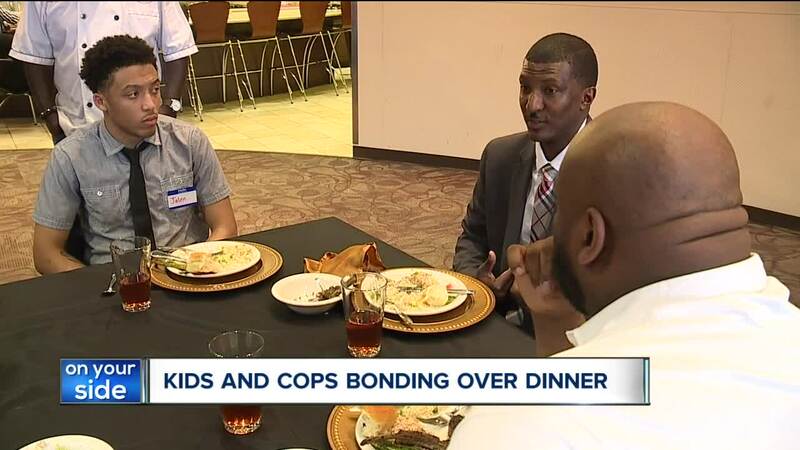 "It doesn't have to be about safety; it can be about being a young black man,” said chef Eric Wells, who served up dinner for the officers and teens. That goes beyond the badge, even for some officers. "It happened to me outside of the uniform,” said CPD Sergeant Vincent Montague about an incident that happened to him. Montague described a long, uncomfortable exchange with police. He said his skin seemingly doubled as guilt when a knock at his door came from police one day. He said officers were investigating a stolen cell phone. “I’m a police officer and I see this stuff happen every day,” said Montague. No phone turned up. Montague said none of his neighbors looked like him and none of them were questioned. Giving advice for dealing with situations like that was the reason for the sit-down. “Because sometimes, it's bigger than you,” said Montague. “Not all of them are bad; just kind of gave me a different view,” said Davin Zigler, one of the teens at the dinner. Officers and teens shared phone numbers as they plan to stay in touch. This story is part of A Better Land , an ongoing series that investigates Northeast Ohio’s deep-seated systemic problems. Additionally, it puts a spotlight on the community heroes fighting for positive change in Cleveland and throughout the region. If you have an idea for A Better Land story, tell us here.